"Americans believe in the reality of “race” as a defined, indubitable feature of the natural world. Racism—­the need to ascribe bone-­deep features to people and then humiliate, reduce, and destroy them—­inevitably follows from this inalterable condition. In this way, racism is rendered as the innocent daughter of Mother Nature, and one is left to deplore the Middle Passage or the Trail of Tears the way one deplores an earthquake, a tornado, or any other phenomenon that can be cast as beyond the handiwork of men. But race is the child of racism, not the father." "In 1957, the white residents of Levittown, PA, argued for their right to keep their town segregated. 'As moral, religious, and law-abiding citizens,' the group wrote, 'we feel that we are unprejudiced and indiscriminating in our wish to keep our community a closed community.' This was the attempt to commit a shameful act while escaping all sanctions, and I raise it to show you that there was no golden era when evildoers did their business and loudly proclaimed it as such." "The killing fields of Chicago, of Baltimore, of Detroit, were created by the policy of Dreamers, but their weight, their shape, rests solely upon those who are dying in them. There is great deception in this. To yell 'black-on-black crime' is to shoot a man and then shame him for bleeding." Overall: I'm not going to make my silly Hunger Games joke because that's silly and you should just read both, as they're both concerned with "race" and taking down your conceptions of such brutally real nonsense. 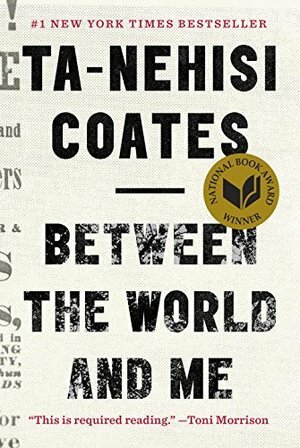 This is a must read for everyone, but its especially poignant for anyone from the DMV area as a big chunk of the book features Coates' childhood in Baltimore and his university years at Howard in DC. This book is extremely well written, personal, poingnant, and moving.